"We are excited to provide an effective and affordable solution to the male demographic," explained Tamim Hamid, Inventor of Theragrow. Theragrow®, developed by a Silicon Valley based medical device company, is now cleared by the United States Food and Drug Administration (FDA) for use by men. Previously only cleared for women, men now have the opportunity to benefit from the at-home wearable hair growth device. In the United States, roughly 35 million men suffer from hair loss due to androgenic alopecia. The Theragrow harnesses the power of laser phototherapy to minimize hair loss and promote growth. 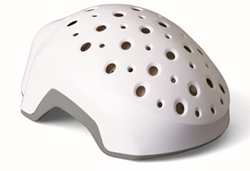 The easy-to-use helmet delivers the same wavelength and dosage of energy proven in clinical trials to rejuvenate hair follicles, reduce hair loss and effectively re-grow hair. The Theragrow helmet uses proprietary lasers with a wavelength of 678 nanometers. Only lasers with a wavelength between 670 and 686 nanometers can penetrate deep enough to reach the base of the hair follicles and stimulate growth; a depth of 3 to 5 millimeters. No other light source, including devices using LED light, can achieve this. "We are excited to provide an effective and affordable solution to the male demographic," explained Tamim Hamid, Inventor of Theragrow. "Women have been experiencing the benefits of Theragrow for over two years and now men can experience them as well." With his background as a NASA scientist, Hamid set out to create a reasonably priced solution that produced real results. "We understand the expense associated with many professional treatments," stated Hamid. "Theragrow helps restore confidence by providing a clinical strength hair rejuvenation therapy at home for a fraction of the cost of other treatment options." The FDA-cleared, hands-free device is designed to help reduce hair loss and thinning due to androgenetic alopecia, as well as to help revive dormant hair follicles. Theragrow, developed by Theradome®, a medical device company based in Silicon Valley, Calif. and made in the U.S.A.,is dedicated to developing the world’s most technologically advanced, science-based laser phototherapy hair-growth solutions. The Theragrow helmet can minimize shedding, thicken existing hair and promote new hair growth. For more information please visit http://www.theragrow.com.